Subaru is known for taking the road less traveled and that goes for the engineering as well. When getting the most from your Subaru, we recommend only trusting factory original and genuine Subaru parts like those available in our parts department at Carter Subaru Ballard near West Seattle, WA. What Makes Genuine Subaru Parts Stand Above The Rest? No other manufacturer has explored the benefits of the Boxer engine like Subaru and the legendary symmetrical all-wheel drive is unlike any other system of its kind. When you enjoy the benefits of this exclusive engineering, it only makes sense to trust factory original parts and accessories. We frequently update our specials so you can have money left over from fixing and improving your Subaru. Take the short drive west from Bellevue, WA to handle all of your Subaru parts and accessory needs at Carter Subaru Ballard. When you visit Carter Subaru Ballard near Tacoma, WA, you will be amazed at how our environment is different from other dealerships. We take pride in putting your needs first without the hassle so when you need the right genuine parts and accessories for your Subaru, come visit our parts department. We are always offering updated specials to make your repairs and upgrades easier. Instead of busting your knuckles in the garage, let the factory trained technicians in our service department take care of it. Not only will this ensure that your warranty is well maintained, you will have no doubt as to the quality of work your vehicle receives. No-hassle service and exceptional deals are just a couple of the things that make the drive from Bellevue, WA well worth your time at Carter Subaru Ballard. Come see the difference for yourself at 5201 Leary Ave. NW, Seattle, WA 98107. 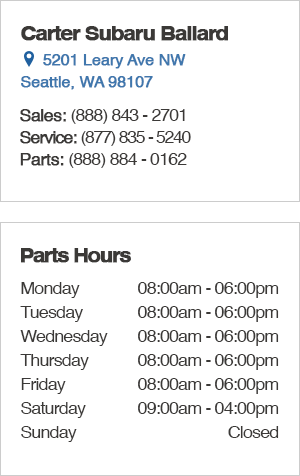 We'll be happy to check stock and get your parts order ready to go when you call ahead at (877) 884-0162. We can't wait to meet you at Carter Subaru Ballard.